We had breakfast in the hotel and were disappointed to see that it was the exact same menu as yesterday complete with the ‘soggy’ description for the hash browns and ‘freshly baked yesterday’ for the pastries. Oh well, it filled us up and meant we only required a light lunch again later. During breakfast we tended to watch the traffic outside the window, comparing it to peak hour in Perth and finding Adelaide very quiet. The main entertainment most mornings was listening to the compulsory little beep every time the filter arrow went green for people to turn left. For some reason, Murphy’s Law no doubt, the 2nd car always saw it and the 1st never did and it amused us no end. 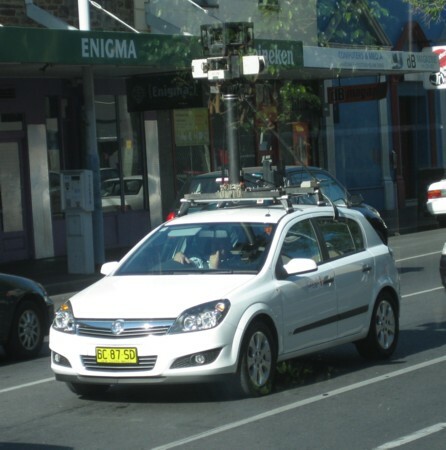 So this morning, gazing out of the windows, we suddenly saw the Google car again in the queue waiting for the lights. I raced for my camera, praying the lights would stay red long enough, and managed to get 3 good shots of it. 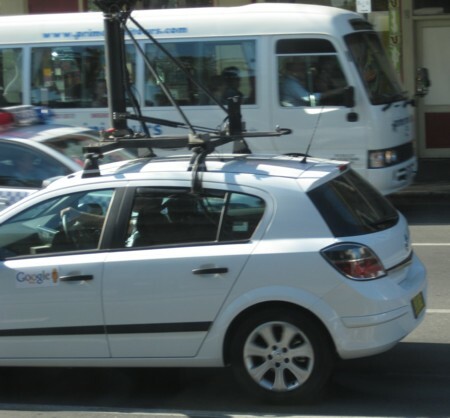 Turning the tables on the Google camera felt very rewarding. We have a friend who saw it one day and he has his picture on the web for all to see. I’ve checked and we’re not on it – yet. But I shall keep checking. 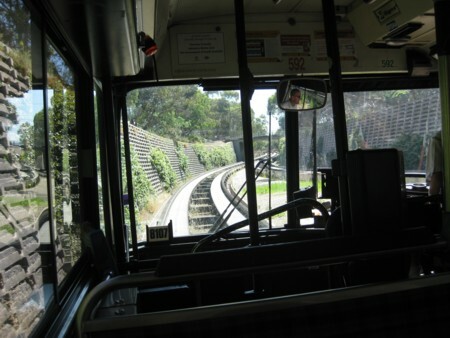 We set off to the tram and from that to Grenfell Street to catch the bus to TTP (Tea Tree Plaza). I wanted to see this shopping centre as it was the one I was most often asked for in South Australia in my directory assistance days but the main highlight was that we would travel along the O-bahn to get there. The bus trip began at a normal bus stop on a normal city street but soon went into a roadway of its own and very soon after that we were travelling along 2 concrete tracks with sleepers between them. The driver kept his foot on the accelerator but let go of the steering wheel and we travelled along at speeds between 60 and 100 kph according to speed signs exactly as you’d find on a road. 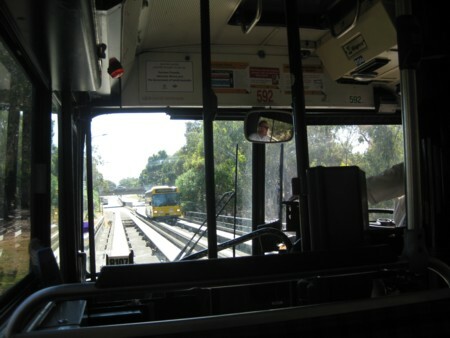 David was very excited to be on the O-Bahn after reading about it for years, and I took some photos of course. I’d have sworn we went through a small tunnel at the beginning but David says we didn’t and a look on Google maps shows we only went under a small bridge – it was a foot bridge at that! But we went down between retaining walls so I guess that’s what I saw to the sides without looking up. May shrugs! Definitely not a tunnel. Tea Tree Plaza was a shopping centre, what more can I say. You’ve seen one Westfield you’ve seen them all, except that it had a Harris Scarfe which was different to WA. David bought himself 2 pairs of shorts and I bought a nice light-weight t.shirt. The thing that we will always remember though, was that all of a sudden they began to play ‘The Last Post’ over the PA. It was incredible. Over a period of a few seconds the entire shopping centre became stilled. Everyone stopped and I said to David “It must be 11th November!” (Remembrance Day – is that all over the English speaking world?) The shop still had pop music playing which felt so disrespectful and I was just willing someone to stop it. Eventually they did and that made the experience even more emotional. I got all blinky and goosebumpy. As the music finished the noises began again and everyone went about their business once more but it was not with the same rush. It really had been a very moving experience. We did our usual routine of keeping left so that we saw the whole shopping centre which was on two levels, the floor level and a lower level with a food hall in it. We chose to have some of the lovely Greek yogurt for our lunch which we’d once before had in a big shopping centre north of Brisbane. We weren’t hungry but this is exceptional yogurt and was worth squeezing in. 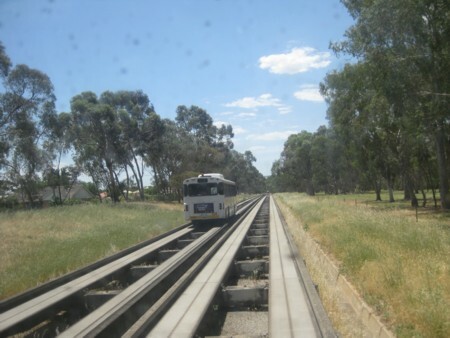 From here we travelled once more via the O-bahn back to Adelaide city. It was 39°C again and we wore hats as a matter of course because we were likely to be out in the sun so much. I also made it a habit to wear the white and yellow scarf I’d bought the day before draped lightly across my shoulders so it covered my arms. This meant I could wear light, sleeveless clothing but have the benefit of cover from the sun when we were away from shade. I soon took to wearing it draped from under my hat so it covered the back of my neck and was not even touching my upper arms and it seemed to catch every available light breeze and waft it around me – beautiful. So we’d completed the day’s planned activity and it was hardly beyond lunch time so we decided to catch the tram and go all the way to Glenelg; the end of the tram’s journey and the ‘best beach’. It was a 40 minute journey with very frequent stops in the city but getting further apart as we got out to the suburbs. In the city, the tram travelled in the centre of the roads but as soon as it was out of the city block it became more like a train with its own fenced-off track, though it did have to stop at some traffic lights along the way. It was a beautiful cool journey as a break in the hot day. We love the heat but a cool break is not a bad thing. Glenelg was your typical ‘sea side town’ with shops along the main road selling clothes, souvenirs and ice creams; and then the restaurants and cafés. We easily found the beach and carefully removed our shoes, tentatively touching the sand to make sure it wouldn’t burn our feet but it was bearable. We went under the pier and stood there to cool off from the short walk from the tram and adjust hats and my scarf so we were comfortable. The beach had a few people on it and one Aboriginal family with an adorable little toddler in the care of an older child. So darned cute we both gave her special smiles. We headed for the water and paddled along. You know how it is, you start in an inch of water and end up getting your clothing hems wet. I tucked my dress hem into my undies to lift it up a bit which felt so freeing – they’d have seen more leg if I was in bathers after all. The water was beautiful and it was so good to splash along with absolutely nothing else in the world to do. Suddenly there was a really warm area. We’d drawn level with a rock wall in the water so it must have prevented the water from moving around as much as the rest so it had really warmed from the sun. And then we were beyond the wall and the water felt really cold. After that we reached a large rock groin so made our way back up the beach, talking to the seagulls there, and moving towards the buildings. Ooch, ouch! The sand was really hot and we did the ‘where’s my shoes’ dance very energetically until they were found!!! The buildings were a very long row of multi-storey apartments with restaurants all along the ground floor, there must have been 15 restaurants or cafés in a row, all with indoor eating areas plus umbrella or canvas covered table areas outside. We’d bought 3 yogurts at lunch and only eaten 2 so we sat and broke out the last one before it went off. It had been with our cold water in David’s backpack and not got warm. From here we just wandered around, exploring the area and the shops. 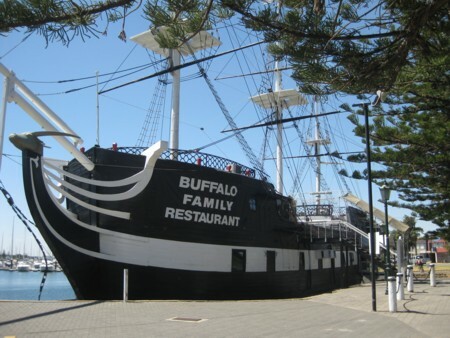 We found an old galleon, minus sails, though it had all the masts, which was a restaurant. The small print showed it was a replica but it was very impressive all the same. But shut. Which is probably just as well or we’d have ordered something to eat just for the sake of eating there and if we weren’t hungry before our yogurt we sure weren’t hungry after it!!! And at the shops I bought a lovely skirt and something else that I can’t even remember. I usually hate clothes shopping but really needed some cool things and got great bargains on everything. And we bought a couple of mangoes from a supermarket as I was beginning to get withdrawal symptoms. Then back on the tram before it would get too busy with commuters – not really fair to add to the busy squash when we could travel earlier. The spa was also calling us and again it was beautifully cooling after the hot day. Tonight we decided to eat at the Indian restaurant on my list. I’d chosen seven possibilities for the week, Indian, Thai, Swiss, Chinese, Italian, Spanish and Korean, just for a balance of choice as we fancied them, and this time we decided to walk and set off at a cracking pace through Rundle Mall. I’d got a map with reference numbers on for all of my restaurants so we knew where we were going but when we got there it was just a large business-style building. And it was hot, and we’d walked fast, and we didn’t have a drink with us. So we had already walked half of the bottom of the square and all of the left-hand side and set out across the top, watching the numbers. No go, so we walked down the right-hand side and things started to improve and, in the final corner, was a small, insignificant door without light beyond it but we tried anyway and it led to a flight of downward stairs. Ahhh! The Jasmine Restaurant. A lovely lady greeted us and we gave her our ‘we haven’t booked but..’ line and she found us a really nice table and filled our water glasses promptly. We drank about 5 glasses of water each as well as beer for David during the meal. As the Alphutte had been, this was linen napkins, beautiful cutlery and crockery and excellent service and we had a really nice meal consisting of an entrée, plain and cheese naan breads and main courses which we shared. We truly did roll out of there stuffed full, phew! After climbing the stairs we completed the few steps which meant we’d then traversed the whole of Hindmarsh Square by accident and walked slowly enough all the way home, where we elected to watch a TV show on David’s little DVD player until it was time to retire to the respective sides of our bed/s. ALL COMMENTS ARE MODERATED BEFORE THEY APPEAR HERE. SPAM WILL NOT SEE THE LIGHT OF DAY!